Exclusive Module 1 training site to ensure you get the training required to pass your test 1st time! 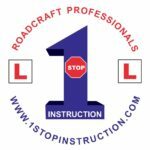 Welcome to 1 Stop Instruction, a motorbike training school based in Ilford, East London, we aim to provide the very best motorbike training across Essex and London. We are extremely proud and privileged to be able to class ourselves as true Roadcraft Professional's, by being one of the few schools with the skills and qualifications to provide motorbike training, driving lessons, LGV & PCV training at the very highest standard. We offer what is probably the cheapest CBT in London, yet at the same time, provide the highest quality tuition - a rare combination! The instructors at our knee down school & wheelie school concentrate their efforts on showing existing riders how to improve their motorcycle handling skills to achieve either a perfect power wheelie or an amazing knee slide. Firstly we monitor riders individual abilities, including balance and traction limits. 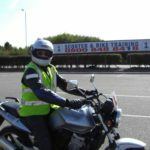 We then take these existing skills and show you techniques which will teach you to have more confidence in leaning the bike into bends, to such an extent that you will be able to stick your knee out and scrape it along the floor, aka getting your knee down. For those of you wishing to learn the art of wheelies, our instructors are highly skilled and trained in showing you the techniques required to pull the perfect wheelie.
" I did their 3-day unrestricted DAS course, which was very well organised and extremely well delivered." "Love these guys. They boosted my confidence in so little time "
"Excellent tuition and training. Anne & Pepsi really know their stuff and provide you with all the tools you need to pass. *"
"Great tutors. Definately would advice to my friends to take their CBT here. One day will do my DAS here"
"Excellent training school very enjoyable , friendly environment great equipment !" "BRIAN you were amazing thank you for everything I will be coming soon to you for full license I definitely confidently recommend this place." "What a day myself and a friend attended the knee down school only to improve my cornering technique by lunch time I had worn most of my sliders away great day well run worth every penny"
"Most motorcyclists like to consider themselves skillful, but it's easy to slip into bad habits!! Come on, get your skills checked and improved"